This is a true budget phone that has a priceya€™s body wrapped around it. 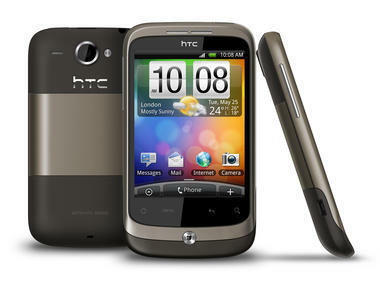 The HTC Wildfire has a powerful Andorid system along with many more impressive features. The HTC mobile phone is a great looking phone that feels comfortable in the hand. The body is solid built and with quality plastic. This is a device that has been built with AMOLED capacitive touchscreen and the pinch-to-zoom feature. 16M colors are supported by the mobile and come with 3.2 inches QVGA and has 320 x 240 pixels. The dimensions of the HTC are 106.8 x 60.4 x 12mm. the display is large and stylish. It has a 528MHz processor and runs on Android. The colors available in the Wildfire are brown, red, black and white. The phone is easy to use and is capable of superb connectivity. The optical trackpad works smoothly and has a sleek design. The texture of the exterior of the mobile has a soft-touch and gives a good grip while working on the mobile. The features of the HTC Wildfire are the dual 3G HDSPA support with high speed and the WI-FI the mobile can handle SMS and MMS along with email very well and gives you a faster web browsing that has Flash Lite support. The device comes with the latest Android 2.1 version and is Outlook email enabled. Apart from these features the HTC is equipped with its own apps and plenty of widgets like Facebook and Twitter. This GPS enabled mobile gives you the right direction using the Google maps. It is well equipped with stereo FM radio with RDS. You can tune-in to your favorite radio station anytime you want. The MP3 player plays in format of MP4/H.263/H.264/WMV9. The camera is a 5MP and has a capacity of 2592 x 1944 pixels. There is a built-in autofocus, smile detection, LED flash and geo tagging feature. The HTC reviews have strongly supported the mobile and the battery life as they give a great stand by performance of 480 hours for 2G. The talk time provided is 7 hours and 20 minutes for 2G. The battery is lithium a€” ion and is 1300 mAh. The connectivity features are the Bluetooth v2.1 with A2DR. There is also the USB of 2.0 version microUSB to transfer data from PC and reverse. The Wi-Fi and the 3G are the other connectivity features. The other features are the calendar, scheduler, To-Do, notes, alarm clock, time clock and predictive text input. The HTC Wildfire price is Rs. 11,390 approximately.